We all should stop using plastic store bought bottle of water and bring our own water witch is cheaper and better and can come in this amazing Tardis water bottle. 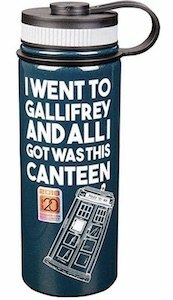 This Doctor Who water bottle is made from strong BPA free tritan and has a wide mouth for easy access and the ability to add ice to your drink. The Tardis bottle can hold up to 32 ounce of water and has a scale on the back so that you can see what you really drank today. 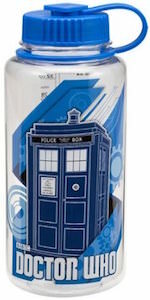 On the front of the water bottle you can see the Tardis with under it the words “Doctor Who” of course.